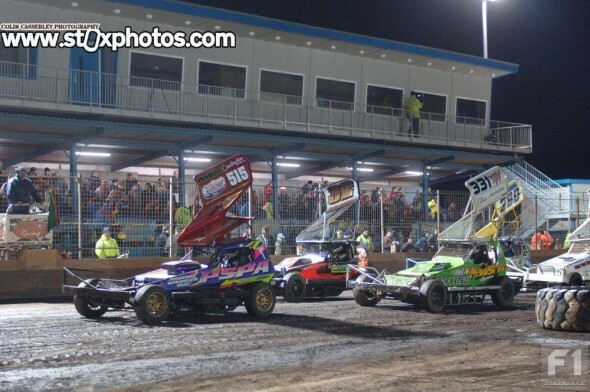 It was off to the Adrian Flux Arena at King’s Lynn this year for the first F1 meeting of the 2016 season; with a bumper turnout of drivers and new car debuts that got the season off to a bang both on the track and also on the much-followed social media that is the norm with the modern F1 fans and drivers. 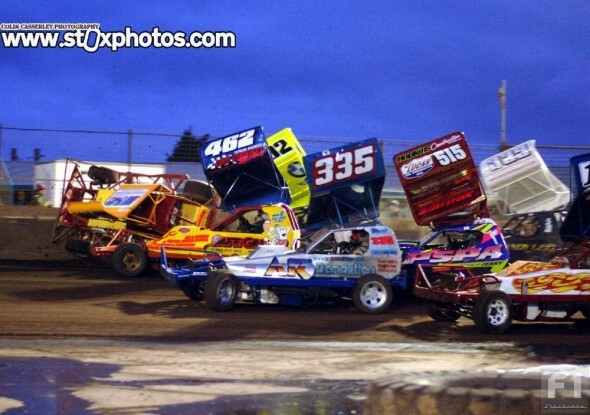 It was with eager anticipation that the BriSCA F1 roadshow returned on Saturday 19th March after its long season lay off for both drivers and fans alike. 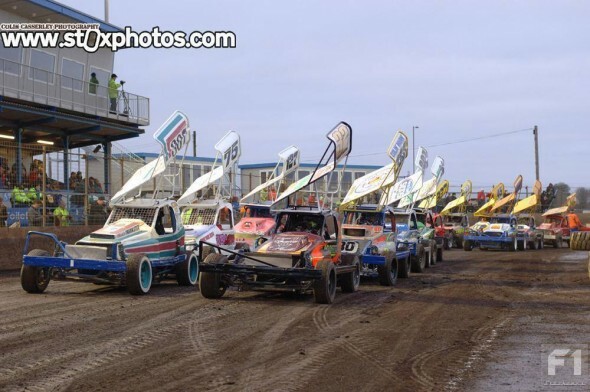 Normally, the first race of the season is a case of who has which cars ready (or still in progress) but this opener saw a bumper turnout, with 50 cars booked in at King’s Lynn, possibly a record in recent years! The recent change in shocker rules (a delayed introduction) also meant that the yellow-grade drivers now had to use control shocks. This seemed to have little effect, with a great number of yellow grade drivers (and whites) making the trip. 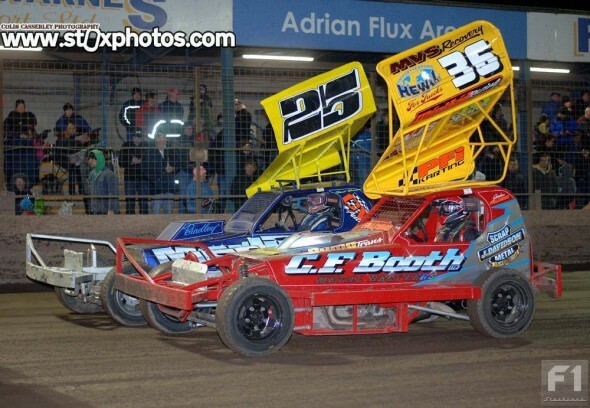 But then again, it was also the White and Yellows Championship race – a culmination of the regular King’s Lynn Whites and Yellows race feature that is always the first and well-attended race at the Arena. 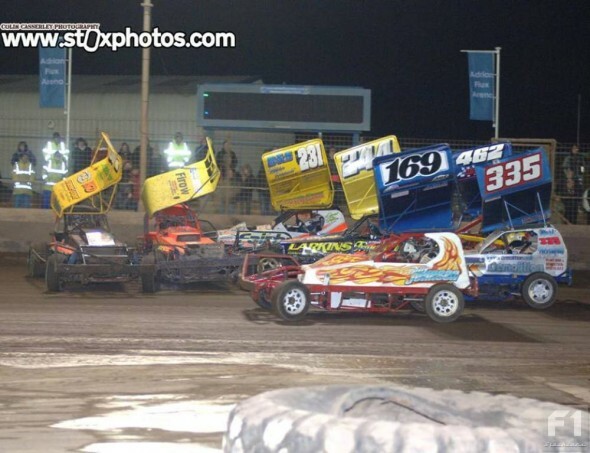 As is normal with King’s Lynn, further improvements have been done over the winter season; with a new race control and hospitality suite being added aloft the main straight stand – barring the introduction of covered viewing on the bends, Buster will be running out of areas to build on at this rate! So, firstly a quick run down on the new cars in the pits. 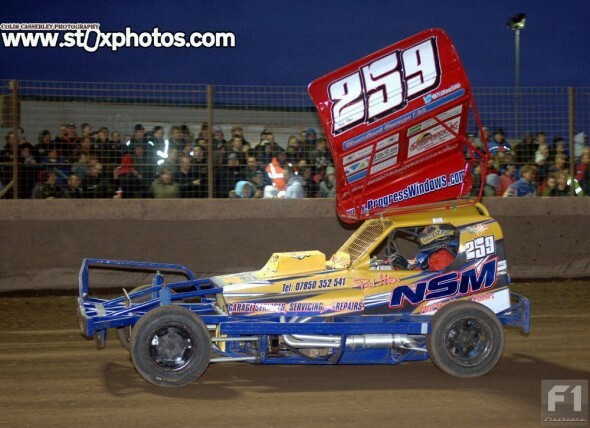 Mark Sargent (326) was out in a brand new Mat Newson-built car, similar in style to last year’s car with the old Finn ex-tilter engine fitted. Mark is still keeping the old car back at base. 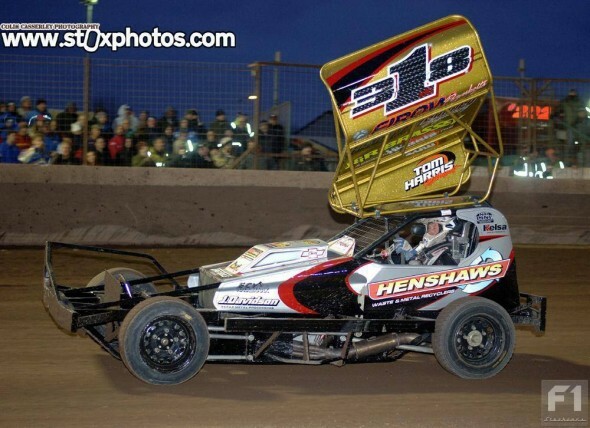 It looks like Mat has had a very busy winter on car work, with his own car looking not much different to the condition it was in after the Sheffield Shootout Finale! 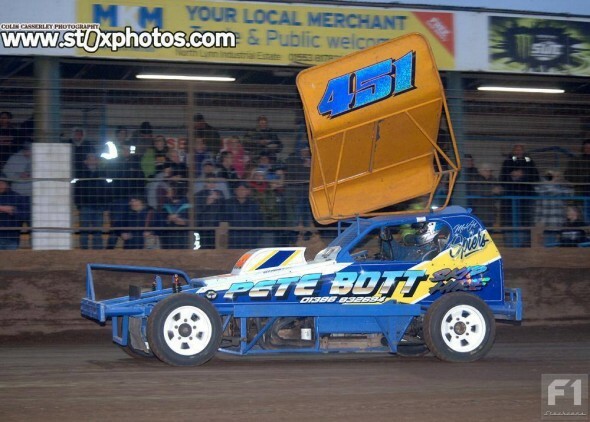 The meeting also saw a welcome return to shale racing for 446 Joe Booth, who has concentrated on tar racing recently but was out in a brand new home-built motor with a small block fitted. The car’s been in construction for a while up at the Booth moor top Huddersfield base and it’s great to see Joe back on the loose stuff – in his own words: ‘we plan to do a bit of both surfaces this year’. 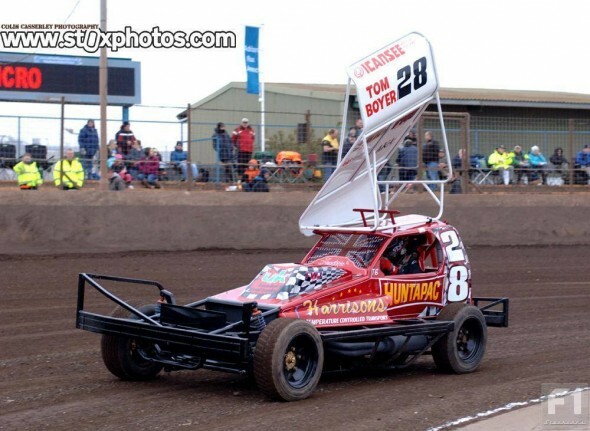 The major talking point pre-race was a brand new car from Frankie Wainman Junior – a stunning new car with a look half of New Zealand styling and, for those old enough, similar to the Willie Harrison wedge car at the rear from the 1980’s with a NZ style back window – perhaps not as “Marmite” as the 390 Stuart Smith car but it’s great to see something different in the pits. 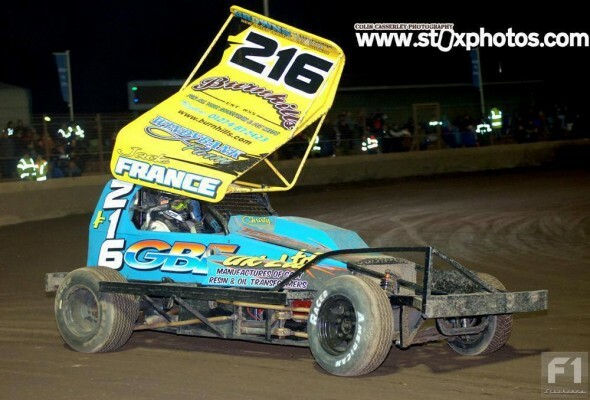 For a fuller insight, see the Wainman Racing website where Frankie has been interviewed by F1Stockcars.com’s own Carl Hesketh. 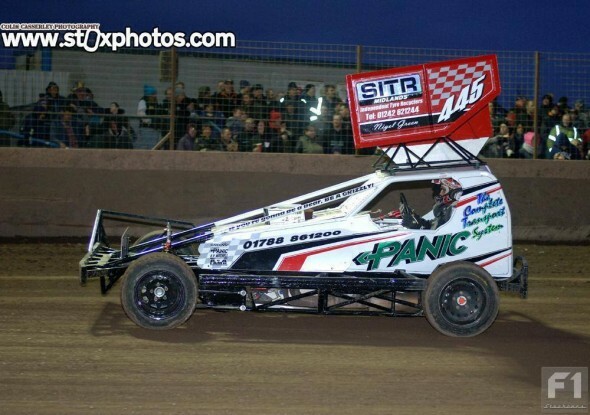 Of the two major title winners from last year, both drivers were running the same cars, Rob Speak’s with a refurbishment and Daniel Johnson’s car with again a major refurb and new side panel, but also with all new suspension and exhaust system. 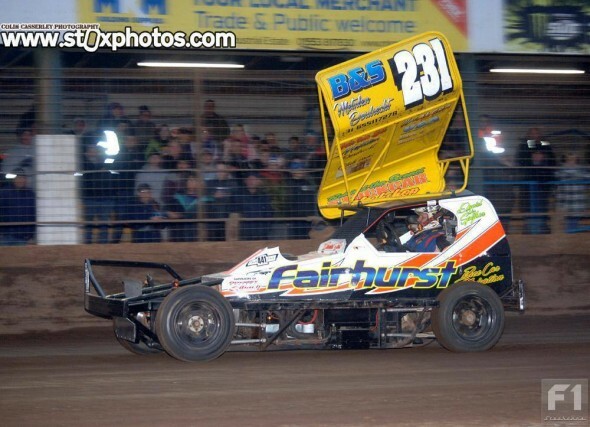 First race up was the Whites and Yellows Championship, with a grid of 22 cars, including Ben Riley, who for this season is up to blue but still qualifies. From the off, the 32 car of Chris Farnell made a stormer of a start and, by lap 3, had a very healthy lead while those behind jostled for position. 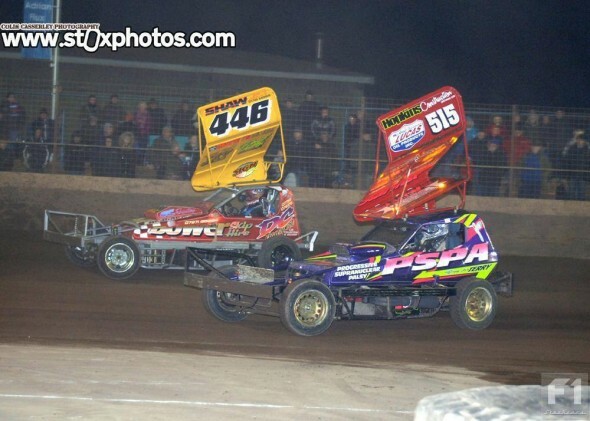 Russell Cooper (415) and 45 Nigel Harrhy were early spinners, with the Cooper car retiring to the infield. 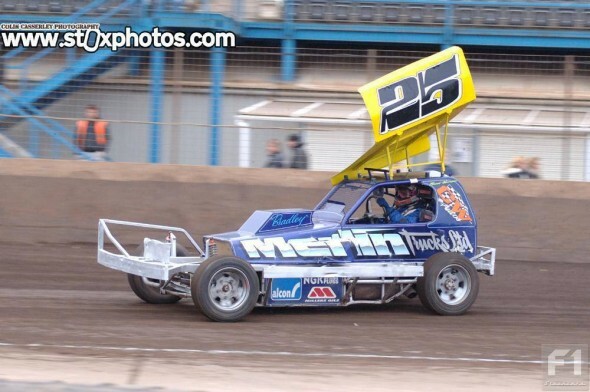 Heat 2 gridded 22 cars which was the first race for the new 515 car. 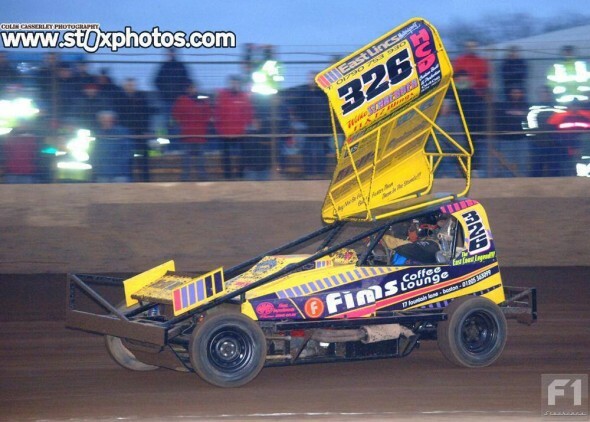 From the off, it was clear the new Wainman car had both pace and grip with Rob Speak in pursuit, Dan Johnson retiring early in the race. By lap 4, it was 28 Thomas Boyer leading from 446 Joe Booth and 463 James Morris in third, followed by a gaggle of yellow and blue tops with Wainman and Speak bearing down fast. It was a case of too many cars hurtling into turn 1 with the outcome being James Morris claiming the first roll over of 2016, the car flipping on its side bringing out the yellows. Boyer must have been gutted as he had a huge lead before the yellow flags and, at the re-start, had Booth second with Scott Davids behind. Speak retired after the start (and for the night – with a disintegrated flywheel/ring gear damaging the bell housing) and 462 span on the main straight. 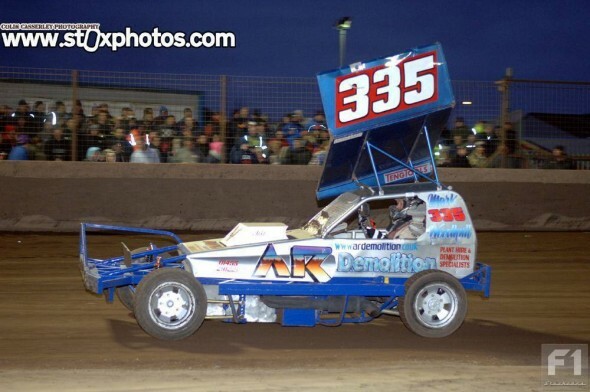 The Wainman car soon hit the front with the Booth car having a tap but it was to be an ‘out of the box’ win for the new Wainman car, from 445 Nigel Green and 335 Mark Woodhall. 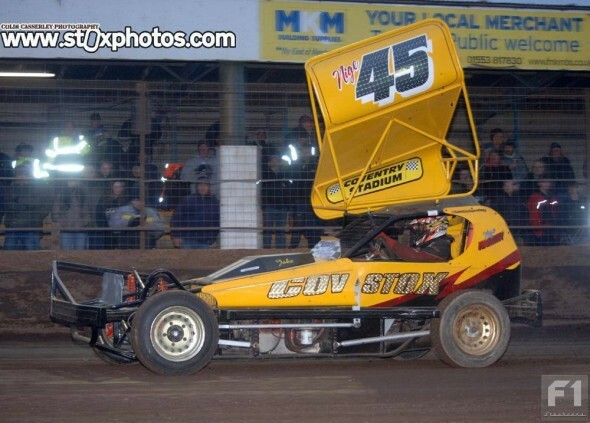 New driver Tom Boyer has made solid start to the 2016 season. 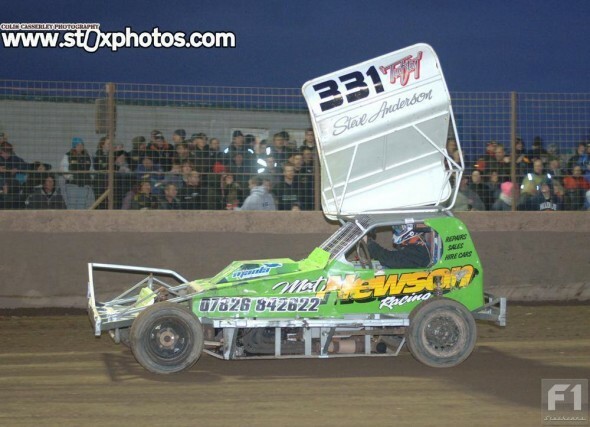 The Consolation saw 19 cars, including the star men of 4, 212 and 16 and red graders Paul Harrison and John Dowson. 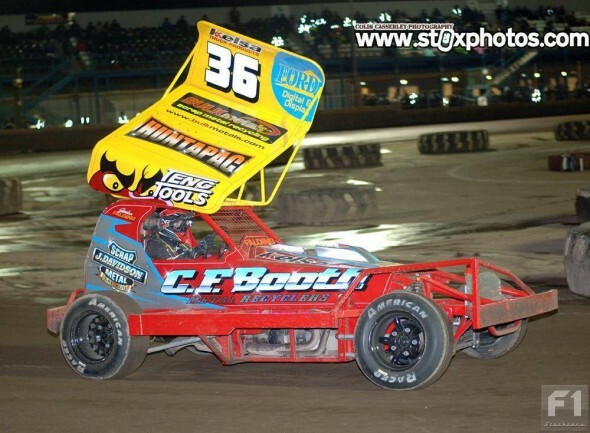 From the off it was 32 Farnell who again hit the front, from 75 Thomas Stephenson in second. 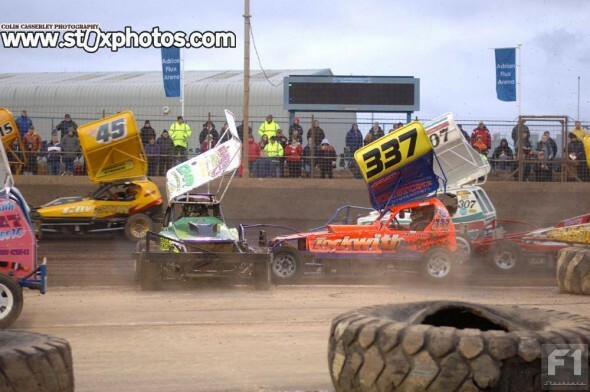 The 94 Dowson car got an early jump and was the lead star-grader, until the yellows came out at halfway for 339 Ant Lee stranded on the main straight and 280 Colin Nairn on the turn 4 fence. 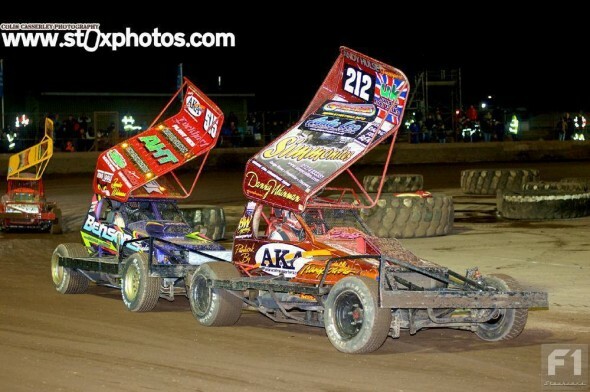 At the restart, it was 32 Farnell from 415 Cooper and Dowson third followed by 4, 212, 231 and 2. The 94 car had been smoking from the back but this cleared, but it was not to last. The Dowson car pulled up on the rolling lap, with what looked like a blown coolant hose. 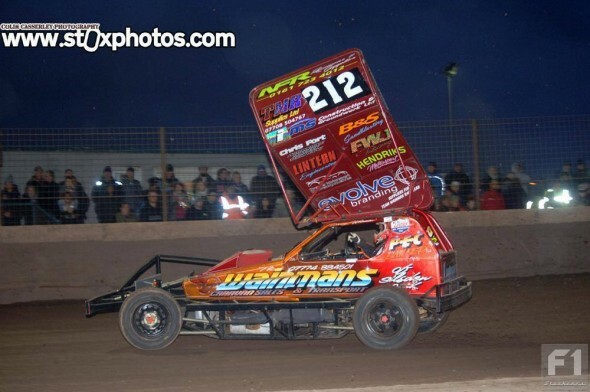 From the off, the Dan Johnson car took a very wide line around the lead cars for the lead soon followed by 212 Danny Wainman and Paul Harrison before the 16 car overhauled Harrison for 3rd. These positions remaining to the end. The higher graders battling during the Consolation. The Final was held on a greasy track, with a drop of rain having fallen prior to the race. 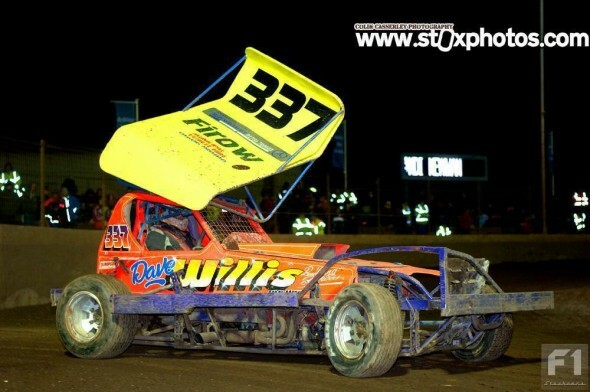 The slippery conditions led to a huge pile up of cars on the main straight, with the majority of cars getting going again but the yellows were brought out for the 337 Dave Willis car side on the main straight with 326 Mark Sargent’s new motor hard up against the nerf rail. 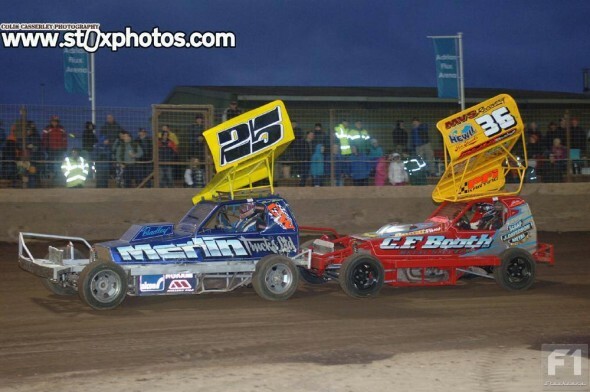 At the restart, it was 28 Boyer who was the lead car, from 451 Spiers and 216 Jack France in third. 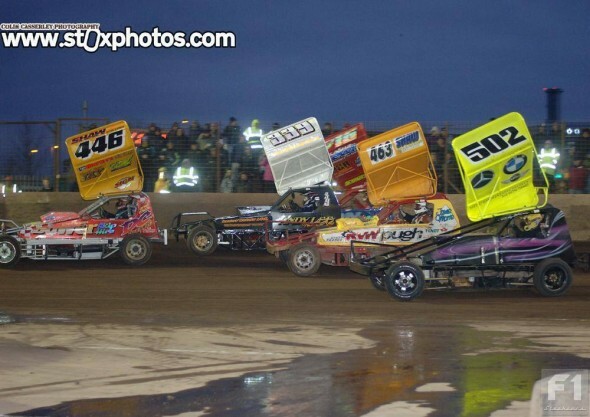 The star men were soon exchanging bumpers, with 445 Nigel Green, Frankie Wainman, Dan Johnson and 259 Paul Hines all having a great scrap. 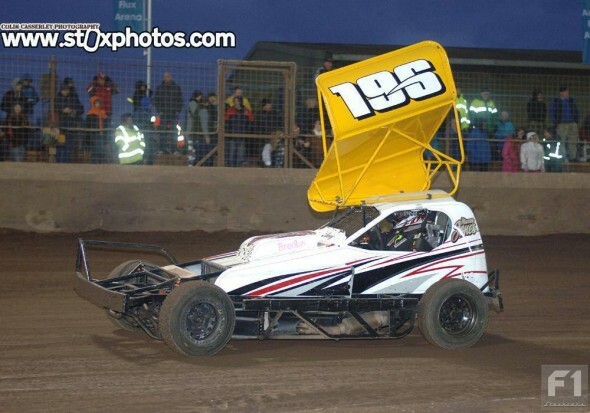 At halfway, the 166 car of Bobby Griffin had a very healthy lead at the front before cruelly hooking up on turn 2, allowing Frankie Wainman through for the lead. 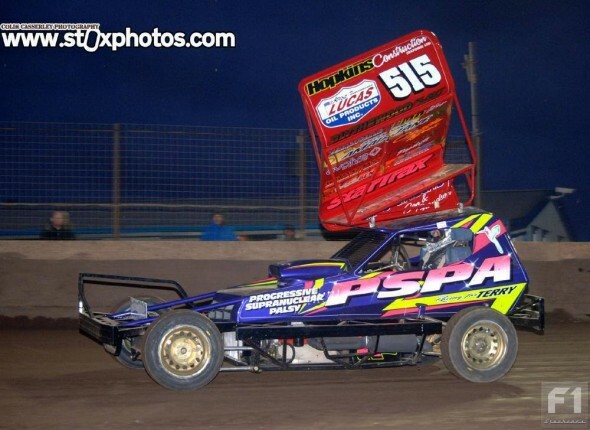 The 515 car, on its first outing, was flying and although not being super quick on the straights compared to the star men, it was the way the car was cornering with ease and grip that was holding the crowd’s attention. 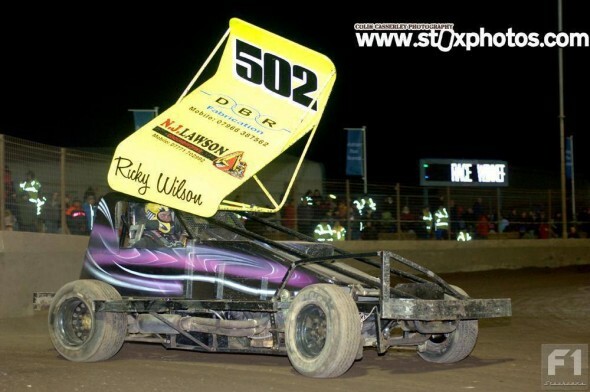 The car seemingly going – and gripping – wherever FWJ put it. 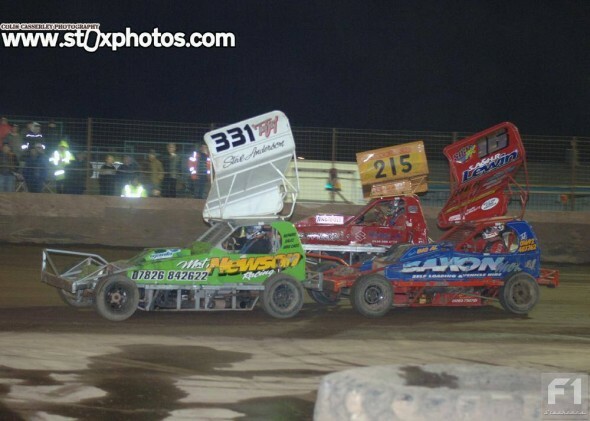 Further back, Green, Johnson and Harrison were having a good scrap between themselves but there was no catching the Wainman car, which came home for another ‘out of the box’ Final win from Nigel Green second and Dan Johnson third. 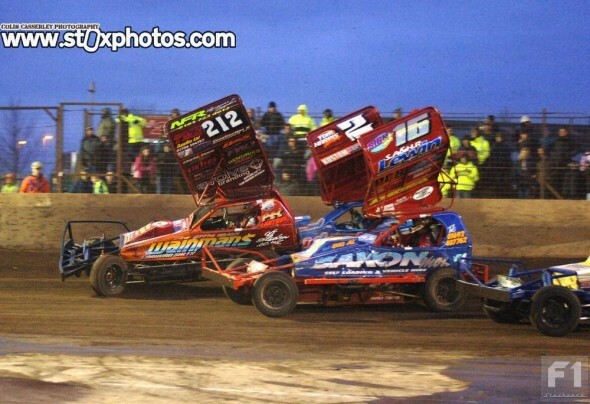 Final Top 3: Frankie Wainman Junior, Nigel Green and Dan Johnson. The Grand National had a very healthy grid of 33 cars on a wet and greasy track, which led to an almighty tangle on turn 2 at the end of the first lap involving about half the field. 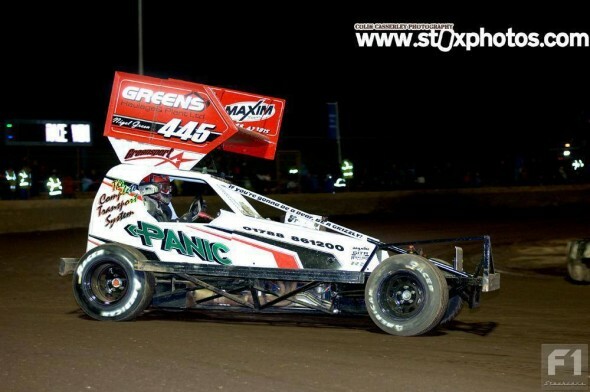 Frankie Wainman Junior, who had started with a lap handicap, was by now on the back of the pack and kindly helped (well, barged really) the 445 Nigel Green and 4 Dan Johnson cars through the melee. These three gained mightily in the early stages. 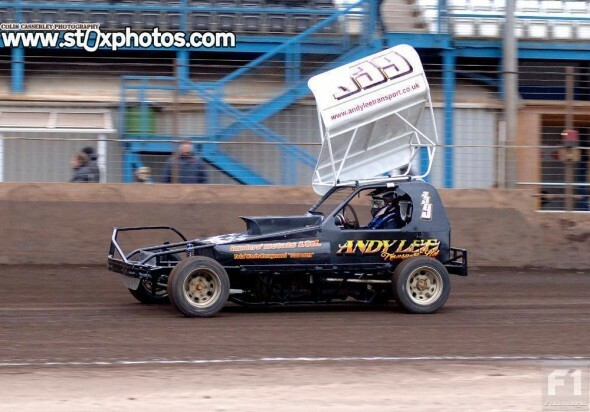 Surprisingly for such an almighty coming together, all the cars got going with the aerofoil-less car of 463 James Morris the lead car. Further back, the cars of 4, 515 and 445 were having an epic battle; with bumpers being exchanged all over and on every corner with some firm and fair hits going on. Up front, the 169 Billy Johnson car was being counted the lead car with the 515 car in second from Dan Johnson 3rd. Nigel Green, who had looked very fast, was forced to retire with a flat. 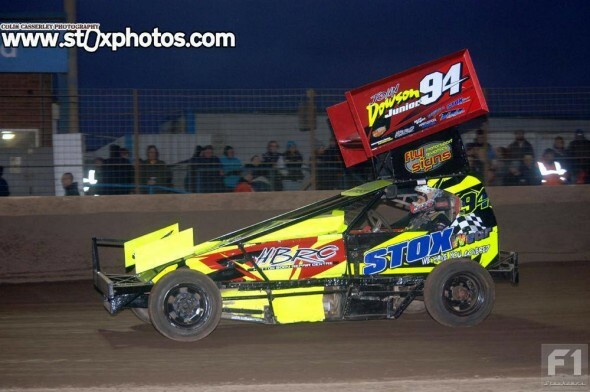 Surely the new FWJ car couldn’t do Heat, Final and GN, could it? The laps were counting down with all eyes on the 515 car, but it was not to be. 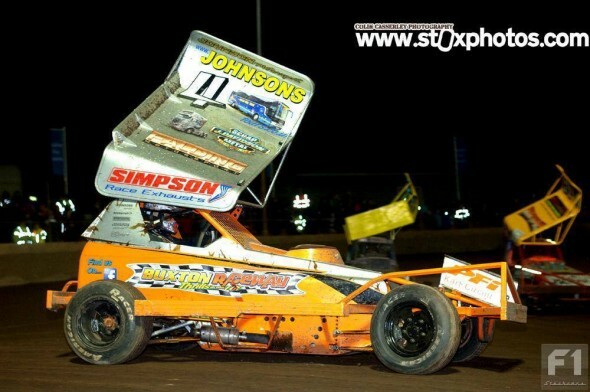 Billy Johnson took the win from FWJ second (only one and a half seconds behind, mind) and Dan Johnson third. 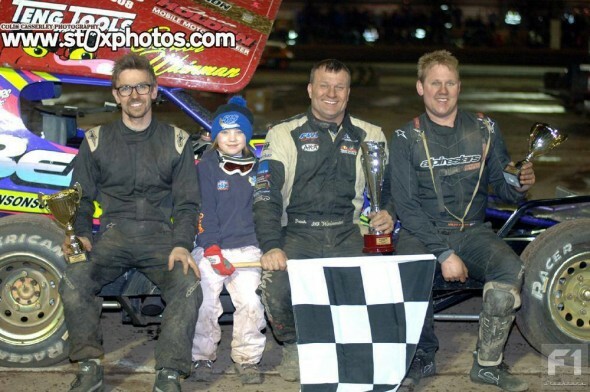 It was a short victory for the 169 car – as the 446 car of Joe Booth was given the win in the end, seemingly coming through the early tangle unseen and hence not being counted as the lead car – so another out of the box winner on the night. 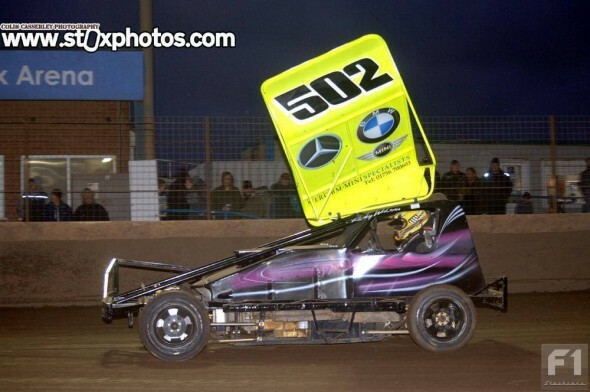 FWJ takes up the lap handicap for the Grand National.